The Eagles are Coming! The Eagles are Coming! A very dear friend of mine was recently bought a lesson at the Hawk Conservancy for her birthday. She is a big fan of birds of prey, especially the kestrel she sees on her daily walk with the dog, but i think the lesson transformed her. Into what remains to be seen! I could definitely see her working with birds of prey but she need to do the Lantra Award in Bird of Prey Management and Husbandry. I remind her that I made the leap from Care Worker into the environment sector- although i had formal qualifications it was the volunteering and building up skills slowly that really mattered in breaking through, not the MSc. 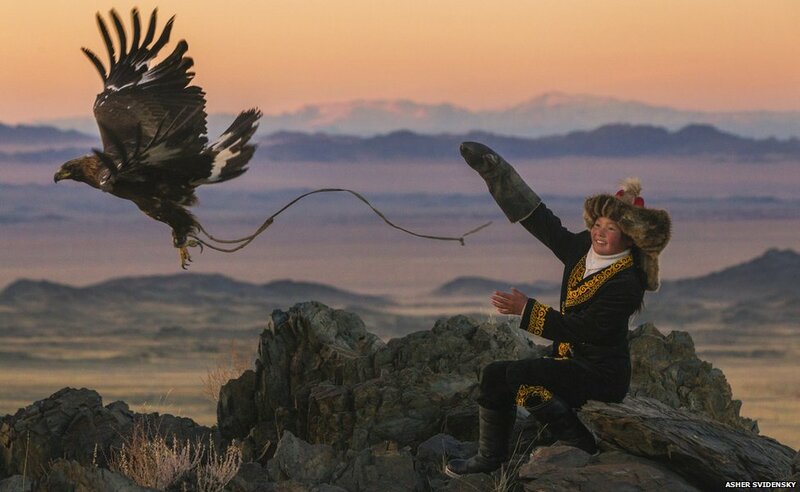 This morning i can’t shake an image out of my head and I finally remembered why; a story on the BBC back in April of the first female trainee Eagle Hunter in the Altai Mountains for 2000 years. I looked up the story again and every time I’m blown away by the images. As I write this I recall a conversation with my Father on Christmas Day. I was stunned to hear he had been to see the Hobbit: Battle of The Five Armies while visiting my brother before Christmas. Not so strange you might say, but there is history of course. Dad can’t do sci-fi or fantasy that well, so this was a bit of a surprise. Then he recounted the story which I had heard a few times before of the picture he drew as a boy of an eagle standing on a rocky precipice. I reminded him of the picture in my 1974 Tolkien Calendar of Gwaihir the Windlord and Bilbo Baggins and we still haven’t got to the bottom of which came first the picture in the calendar or the memory of the drawing! 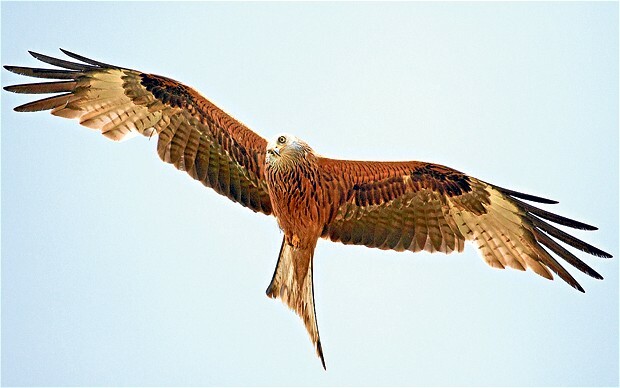 And of late as I pass below the chalk escarpment of the Surrey Hills near the Mole Gap on my way home to Dorking via Guildford, I’ve regularly spotted two red kites drifting laconically over the fields and hedgerows below The Wotton Hatch. I have seen soiltary birds before down this way but never a pair. I couldn’t be sure if they were mates, but I hope so. 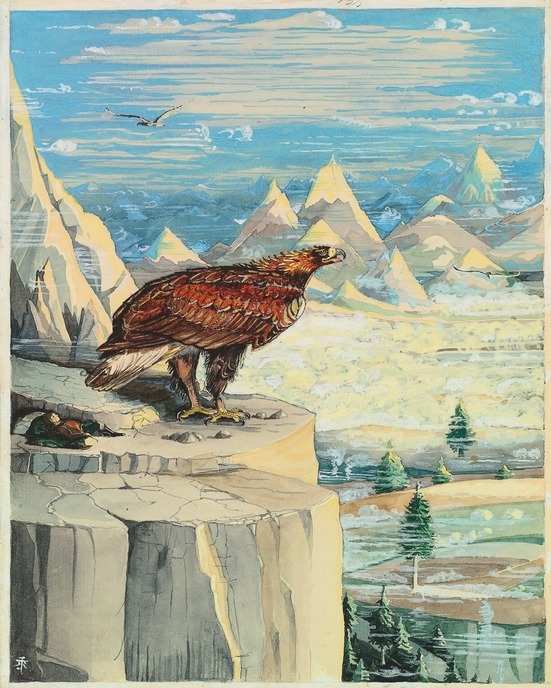 I’m sure there’s some psychological resonances going on here: a return to the instinctive, the need to take flight, views from above, ability to see hidden truths, hunting success (which remains an elusive prey). I’m grateful to my friend, ever my muse, and my father for pulling these connections together from the Moria- like mines of my subconscious. 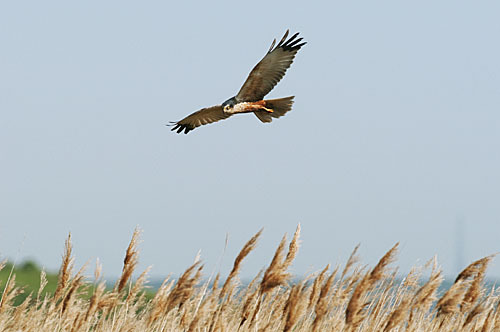 And just before I sign off, my favourite bird of prey, the Marsh Harrier. So reminiscent of good times in East Anglia working for the RSPB. Today I’ve been lucky to have two very different yet related experiences of Surrey Rivers and has underlined for again the importance of a vibrant and varied landscape for our wellbeing. This morning and into the early afternoon I’ve been walking the River Mole with the second batch of 13 RiverSearch volunteers teaching them how to undertake walkovers to assess the status of a river for Water Framework Directive issues such as diffuse pollution and barriers to fish movement. We set up RiverSearch recently on behalf of the Wey Landscape Project to offer volunteers a way to become more connected with their local river and at the same time meet the need for more information about the status of rivers and the wildlife using them. We started the day with talks at the Juniper Hall Field Studies Centre where staff are always friendly and helpful despite the fact they are themselves very busy with school groups most of the time. Then we moved over to Norbury Park and followed a stretch of the Mole into Leatherhead, recording the pathways for siltation and pollution, barriers to fish passage and the presence of non-native species like Himalyan Balsam. It was a beautiful sunny afternoon and the river was alive with Banded Demoiselles, chubb, trout and even a kingfisher. All the volunteers seemed happy with the day and are looking forward to taking on their own stretch of river to survey. Life can only be lived in the present after all, but its experiences can be told and retold, and each time we might find something new. 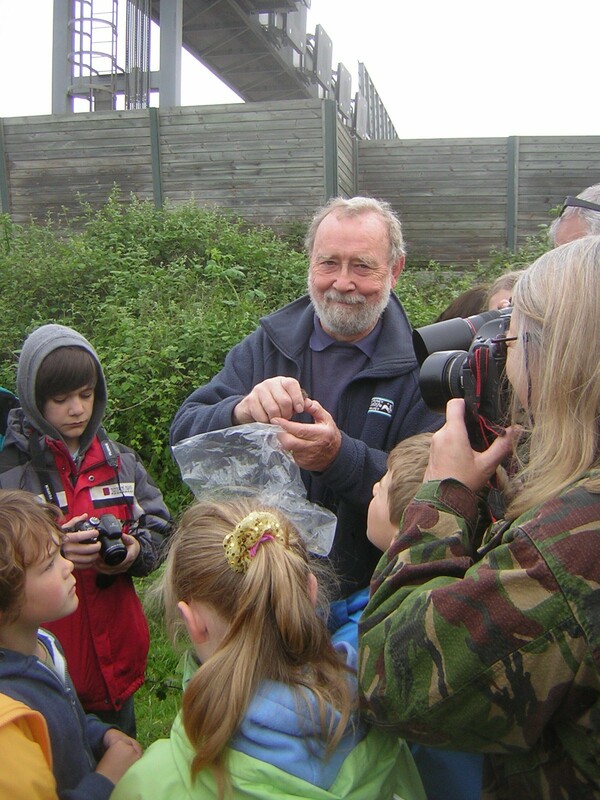 Its reminded me the importance of storytelling in my own work to protect our natural spaces. Not everyone is in tune with wildlife and the natural world in a direct way, but in each of the stories i heard this evening, a sense of place, a sense that all our lives are interactions with the landscape around us emphasises the importance of a rich and varied environment to stimulate our minds and enrich our lives.